As the open clear blue skies and bright sunny weather herald, yet another big match season dawns; Be it Royal-Thomian, Joe-Pete and many cricket encounters of traditional importance. The value of a traditional cricket encounter is that young and old, staunch and true together with those who departed after learning and those who left without learning will converge in large numbers (Even from Overseas) along with many other cricket lovers to witness the ‘Blue’ or the ‘Saints’ battle and partake as well in the festivities that centre around in these two glorious events. The de Mel brothers (standing from left): Cletus de Mel, Carl de Mel, Rev. Fr. Joe de Mel. (Seated from left): Rodney de Mel, Royce de Mel, Maurice de Mel. As I have always mentioned the Josephian-Peterite Cricket encounter which is commonly known as the ‘Battle of the Saints’ cricket encounter is one game which very often produces bright and entertaining two days of cricket and a game played with rich traditions. As for me; I Would for the benefit of the young and the cricket lovers in general; wish to recall to memory the 14th Joe–Pete encounter which was played in 1948.This year is of great importance since we gained Independence from British and the match was played at the Old Victoria Park SSC grounds on 19th and 20th of March 1948. The Josephian team was led by that brilliant all rounder Joe de Mel and the Peterites were under Mike Chanmugan another versatile allrounder produced by the Bambalapitiya school. It was significant that from the very first second that the two captains went out to middle to toss for the choice of innings at the old SSC grounds, Victoria park; this game became Joe de Mel’s match. He won the first battle by winning the all important toss and without any hesitation elected to bat first on a perfect Batting strip. Yet within few minutes it was St Peter’s match. Out strode Joe de Mel again and Josephians were back in the fight, sensation followed sensation, fortune swayed from side to side and by the end of the first day; It was Joe de Mel’s match again. On the second day within hours St Peter’s wrested the control back but for a brief period it was anybody’s game and it almost became no body’s game till ex- Josephian. Gerry Jayasuriya the Peterite tailender enlivened proceedings and when the fate of the match was in the balance. Then Joe de Mel; The Josephian skipper himself administered the ‘coup de grace’ and dealt the final blow to the Peterite hopes by bowling last man Gerry Jayasuriya out to give the Darley Road School a historic seven run victory! There is no doubt this is the most thrilling encounter played in this 75-year-old Battle of the Saints history. As you look at the the match of 1948 in general the Peterites look a more formidable outfit packed with experience. They had six coloursmen who represented the Dion Walles’s invincible teams in the previous two years. They included the captain himself Mike Chanmugan, Harold de Silva, Darrel Weinman (later a famous neuro surgeon). Oswald Martinus, Douglas Fernando, Malcolm Vanakardie but yet they tasted defeat at the hands of Royal and St. Anthony’s. On the other hand the Josephians looked a fresher laden side with only skipper Joe de Mel and Tommy Rodrigo being the Coloursmen. However they remained unbeaten throughout the season. To recount and recollect this historic encounter Joes started disastrously by losing four wickets for just 25 runs. But some intelligent batting by No. 04 bat Oscar Dalpethado and skipper de Mel; Joes reached a modest 180 in their first innings. Bobby Ghouse was the pick of the Peterite bowlers where he took an impressive five for 42. When the Peterites started their innings they were well on course for a huge first innings total when they were sitting pretty at 116 for four. Then Joe de Mel strategically introduced to the attack and what a remarkable turn around of events thereafter. The game had taken a sudden turn and Peterites lost their last six wickets for the addition of just 18 runs. Finally the Petes were bundled out for paltry 134. The chief wreckers were Joe de Mel and Reggie Bagot who claimed 3 for 15 and 3 for 32 respectively. When the second day resumed the Josephians enjoyed a slender 46 run lead. However their fortunes soon were in “Rough Waters” when Peterite spinner Malcolm Vanakardie bowling to an impeccable line. The Joes could muster only 88 runs in the second essay and Petes were left with 134 runs target with an ample time of 3 ½ hours of Play Left. Malcolm Vanakardie took 6 for 17 to destroy the Josephians in their second innings. Joes walked in to the field with much determination to defend this mere 134 runs openers cheaply. Then Harold de Silva and Bobby Ghouse the score to 90 for the loss of 04 wickets. Petes were left with 44 runs to get and their supporters looked jubilant since they were heading for ‘Hatrick’ of wins. At this moment Lucien Dep chipped in with two quick wickets, Donald Perera ended Harold de Silva’s resolute defence and the wicket of Hingert; Petes slumped from 90 for 4 to 93 for 8. Then a brief batting display of Carlton Senewiratne and Gerry Jayasuriya took the score to 121 for 08 which somewhat revived the Peterite hopes. Joe de Mel was once again in the thick of the action when he brought off a spectacular catch to dismiss Senewiratne off Dep for 09 and that brought the last Peterite batsman A. Nathan to the wicket. When the score reached 127 skipper Joe de Mel the Josephian skipper brought himself on. In his second ball de Mel disturbed the defence of Jayasuriya and sent his stumps Cartwheeling! A sensational game of cricket was over and the ground was packed with Josephians with blue and white flags fluttering with sea of heads. Finally, Joes have clinched it by a whisker! A seven run win for the Darley Road School. Like the Wijayaratne dynasty of St Joseph’s the de Mel brothers too have turned a golden leaf in the history books of this great Institution. 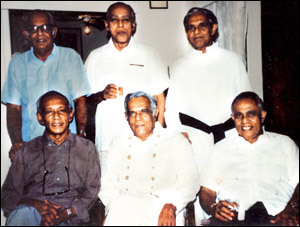 Royce de Mel was the eldest of the six brothers who excelled in athletics and later went on to be the first Sri Lankan Commander of the Sri Lanka Navy. He was followed by Maurice de Mel, Rodney de Mel, Carl de Mel, Cletus de Mel and the youngest Joe de Mel (Now Rev. Fr. Joe de Mel) brought much repute to their Alma Mater by excelling in athletics and cricket respectively. His grand nephew Prasan Leanage was a contemporary of yours, truly and a renowned cricketing warrior who led the Darley Road School at Cricket in 1989 and at present rendering a yeoman service by heading the Cricket Advisory of St. Joseph’s. “Rev. Fr. Joe de Mel still a source of inspiration. He loved and still continues to love sports and particularly Josephian cricket. He is an exemplary warrior in God’s World” observed Rev. Fr. Sylvester Ranasinghe the present rector of St. Joseph’s. To his opponents Joe de Mel was constantly an image of sullen defiance. His friendly and smiling face ; sometimes rushed his opponent to think too kindly of his prowess and his astuteness. As it has been said before of him no one ever saw him perform on or off the field with anything but grace and dignity.